Although it hasn't been officially announced yet, the Samsung Nexus Prime has already been listed as “coming soon” by an online cellphone retailer based in Singapore. The much anticipated smartphone has its own spot on the retailer's web page where the majority of its tech specs are listed and a handful of photos hint at what the device should look like when it launches. 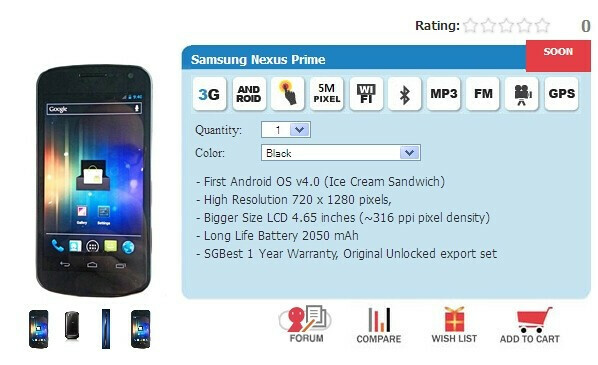 According to SGBEST – the guys that added the Nexus Prime to their online store, the first Android 4.0 Ice Cream Sandwich device will have a 4.65-inch display with 720 by 1280 pixels of resolution, which coincides with what some speculations are pointing at. The listing also mentions the existence of a 5-megapixel camera on the smartphone's back capable of shooting 1080p video. What we find interesting, however, is that a dual-core Exynos chipset clocked at 1.5GHz, presumably the Exynos 4212, will power the Nexus Prime instead of the TI OMAP 4460, if the listing is to be believed. Another spicy detail is that the smartphone should have a multi-mode 3G/4G radio on board combining HSPA, LTE, and EV-DO Rev. A connectivity. 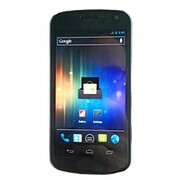 Its battery should also leave a good impression as it will allegedly have a capacity of 2050 mAh. Sadly, the photos that the retailer has used are nothing we haven't seen so far. One of them is a cutout from that Nexus Prime hands-on video, the other is a crop from that Samsung teaser, and the third shot looks suspiciously familiar to the well-known Nexus S. That leads us to believe that the retailer could be just trying to get attention by using the hype around the Samsung Nexus Prime. Or could the listed tech specs be on the right track after all? We lean towards option “A” for the time being, yet the truth will surface as soon as the Nexus prime gets announced officially. lol... really?? kinda fake if you ask me under GPS it say "Yes, with A-GPS support; Nokia Maps" Nokia Maps ??? fake and ***?? Super AMOLED Plus isn't currently capable of HD resolution on a 4.65" screen. That's why it's Super AMOLED Pentile. And it'll look gorgeous anyhow. If you can see subpixels on a 316 ppi screen, you must have superhuman sight. I know you are disappointed on how the iP4s came out to be, that's just the way how it goes so stop bashing android coz its way better than your garbage iP. It's not better, it's just different. Stop bashing the 4S for not being an Android. It is what it is. I aint bashing it coz it's not Android, I'm bashing it coz like it or not, it's the biggest upset in tech world this year. And also because THE_GAME5 is bashing android. I'm just getting even. hehehhehehehe...sgbest.com has wiped everything off its site. I wonder why..? so its mixing and matching rumors? the 5mpx camera with the exynos? I can totally deal with that..lol If the rumors are true, the 5mpx camera is supposed to be awesome since they are redesigning the camera hardware and software. mpx means nothing.. its just a number. You and I know that, but it wouldn't look good for Google when people compare specs against the iPhone 4S and all the other high-end Androids. As for this Singaporean listing, I call BS on the whole thing. Nice. "I think the specs they posted are complete crap... well, except for the one that I like." Can I root for OMAP as a jingoistic pro-USA type thing? there is nothing wrong with the specs listed.. what exactly is complete crap? The fat battery? 720p screen? ICS? Exynos?.... ooooh u mean the 5mpx camera right? lol.. mpx mean nothing. its just a number not indicitive of quality. if its a 5mpx or 8mpx it doesnt matter, its all about the quality of the hardware and software. See my comment above regarding the camera. You and I may realize that # mpx doesn't make a camera good or not, but show me a *premium* phone introduced in the last 6 months that has less than an 8 MP camera. It's not a matter of quality unfortunately, it's a matter of marketing. You called the post junk, but then glommed onto the fact that it said Exynos. If it's junk, it's junk and I wouldn't use any of it to get your hopes up further. The one absolutely certain rumor is that the Nexus Prime will have a Super AMOLED screen, and this "source" doesn't even get that right. Of all the absurd, unnecessary stories on PA, this ranks somewhere near the top. Once a retailer posts actual photos (i.e. not ones where you can see the reflection of the cameraman) then there might be something. I surely hope the 5 megapixel camera is a mistake. It makes no sense for Samsung to release 8 megapixels on other phones and just 5 megapixels on one of the most anticipated phones ever. What a huge disappointment it will be to let an iphone 4s have a better camera. Hope this is wrong! I think the iPhone is a perfect example of why the megapixels actually don't make all the difference. Unless you are actually enlarging the photos substantially, anything over 5mp is not going to make as much of a difference as other parts of the camera. It doesn't say any of that on their site now. Nobody's buying 5 megapixel, period, nobody's interested in anyone's explanations and excuses. I kind of hope its 5 megapixel with a stupid curved screen so I can just laugh at it and forget it and get the sgs2 on sprint. I got the Epic 4G Touch and although I am extemely interested to see what Samsung and Google have up their sleeves, I do not have any buyers remorse. I would think that this phone would be capable of the ICS update eventually and aside from that this phone is a beast in the hardware department.